It looks like most late ripening vineyards had perfect conditions to allow the development of noble rot in 2008. The Clos Windsbuhl was taken over by the Domaine in 1987 and we made our first wines in 1988. Already 1989 showed us the potential for this vineyard to produce late harvest style wines in Pinot Gris, from vines that planted in the 70s or before, we are not quite sure! Early botrytis is very rarely a blessing as it often happens under warmer temperatures and evolves very quickly into a messy mould. Late botrytis, if there are enough dry periods so it can dry out, develops on riper grapes and stay ‘cleaner’ with no or less visible mould on the berries. The effect is a wonderful transformation of some components in the berries due to enzymatic reactions and a concentration of sugars, acids and some other elements. Pinot Gris is surely a more neutral grape than Riesling or Gewurztraminer, so I believe that it is the grape variety that can express perfectly the character of botrytis while respecting the vineyard personality, and this is important for the Windsbuhl. 2/2010: the colour is slightly deeper, sign of more noble rot influence and dry extract. The nose boasts the Windsbuhl character with lots of minerality and toasty savoury aromas. The palate is concentrated, hides the sweetness behind a tight acidity and lots of chalky influence. Very long and full finish with cooked salty caramel flavours. 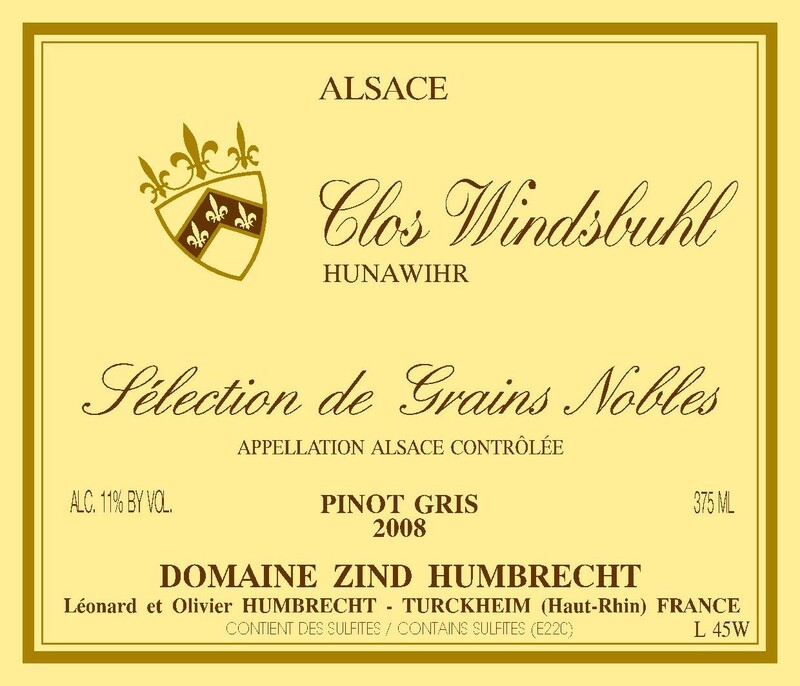 The Windsbuhl SGN is perhaps less creamy or sweet than the other SGN made in 2008, but it needs to be tasted at the end as it definitely has the strongest personality.